Local people are urged to keep checking whether they can access the technology by logging onto CSW Broadband’s new online map – www.cswbroadband.org.uk/latestmap - which is designed to give local households and businesses more detail than ever before about the roll-out. Issued by Warwickshire County Council and BT on behalf of the CSW Broadband partnership. All Openreach news releases can be accessed on our web site. The CSW Broadband roll-out is using a mixture of technologies. These include Fibre-to-the-Cabinet (FTTC), which provides download speeds of up to 80Mbps and upload speeds of up to 20Mbps, and Fibre-to-the-Premises (FTTP), which is capable of delivering download speeds up to 1 Gigabit per second (Gbps) and upload speeds of up to 220Mbps. In addition there are some premises that are currently connected directly to the telephone exchange rather than via a green roadside cabinet, sometimes known as Exchange Only (EO) lines. In order to connect EO lines, further roadside cabinets have to be installed. Speeds referred to are the top wholesale speeds available from Openreach to all broadband service providers; speeds offered by service providers may vary. The CSW Broadband programme is made up of different phases and contracts. Contract 3, Part 1, (announced September 12, 2017) will total in excess of £28 million. This includes £4.8m from the local authorities in Coventry, Solihull and Warwickshire, £7.2m from the Department of Culture, Media and Sport’s Broadband Delivery UK (BDUK) programme, £2m* from the European Regional Development Fund (ERDF), £13m from BT Group and £1m from Coventry & Warwickshire Local Enterprise Partnership (CWLEP). Almost 90 per cent of premises will be served by FTTP technology. * £2m funding comes from the England European Regional Development Fund as part of the European Structural and Investment Funds Growth Programme 2014-2020. The Department for Communities and Local Governmentis the Managing Authority for European Regional Development Fund. Established by the European Union, the European Regional Development Fund helps local areas stimulate their economic development by investing in projects which will support innovation, businesses, create jobs and local community regenerations. For moreinformation visit https://www.gov.uk/european-growth-funding. Contract 2, Part 1 of the CSW Broadband programme was announced in February 2015. The deal was spearheaded by Warwickshire County Council and Solihull Metropolitan Borough Council, which are contributing an initial £3.68 million and £0.38 million respectively, with an additional £2.61m from BT and a further £4.06m from the Department for Culture, Media and Sport’s Superfast Extension Programme (SEP). When complete, it will increase the percentage of homes and businesses able to access high-speed fibre broadband in Coventry, Solihull and Warwickshire to nearly 94 per cent when combined with the first phase of the CSW Broadband roll-out already underway and the private sector investments of companies like BT. Contract 2, Part 2 was announced in January 2017. Funding for this stage was made available to the CSW Broadband programme as a result of the ‘gainshare’ mechanism in the original contract. It was triggered by strong take-up of fibre broadband by local households and businesses. The first part of the CSW Broadband roll-out is known as Contract 1 which started connecting the first homes and businesses in April 2014. 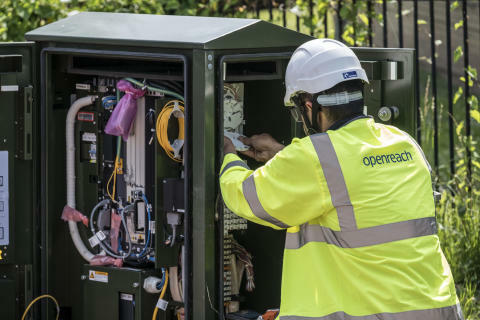 This £15.47 million deal was spearheaded by Warwickshire County Council, BT and the Government’s Broadband Delivery UK (BDUK) programme, to enable around 40,000 premises to access high-speed fibre broadband. Superfast Britain is a Government programme of investment in broadband and communication infrastructure across the UK. Run by the Department for Culture, Media and Sport, this investment helps businesses to grow, creates jobs and will make Britain more competitive in the global race. £150m to improve quality and coverage of mobile phone and basic data network services. Our 30,400 people work on behalf of more than 580 communications providers like Sky, Talk Talk, Vodafone, Plusnet, EE and BT. Our fibre broadband network is the biggest in the UK, covering more than 26.8 million premises. And our technology is the basis of Britain’s thriving digital economy, which is the largest in the G20 as a proportion of GDP. We’re an independently governed business within the BT Group. Our business is highly regulated, and more than 90 per cent of our revenue comes from services that are regulated by Ofcom. Any company can access our products under the same prices, terms and conditions. To find out more about us and what we do, go toopenreach.co.uk.